de Havilland Mosquito NZ2305 outside due to the construction of a new hangar on site. NZ2305 appears to be largely externally complete. View from the rear starboard quarter. Image courtesy of Peter Lewis, pvlewis@woosh.co.nz. For a larger (2000x1334, 507kb) version of this image, click here. de Havilland Mosquito NZ2305 outside during the construction of a new hangar, view from the port side. Image courtesy of Peter Lewis, pvlewis@woosh.co.nz. For a larger (2000x1334, 631kb) version of this image, click here. de Havilland Mosquito NZ2305 outside due to the construction of a new hangar on site, view from the front starboard quarter. Image courtesy of Peter Lewis, pvlewis@woosh.co.nz. For a larger (2000x1334, 574kb) version of this image, click here. de Havilland Mosquito NZ2305 in the process of being assembled. Image courtesy of Marcus Bridle. For a larger (1280x960, 310kb) image, click here. de Havilland Mosquito NZ2305, reassembly in progress, view of fuselage and starboard inner wing. Image courtesy of Marcus Bridle. For a larger (1280x960, 315kb) image, click here. de Havilland Mosquito NZ2305, reassembly in progress, overall view. Image courtesy of Marcus Bridle. For a larger (1280x960, 311kb) image, click here. de Havilland Mosquito NZ2305, reassembly in progress, overall view. Image courtesy of Marcus Bridle. For a larger (1280x960, 309kb) image, click here. de Havilland Mosquito NZ2305, reassembly in progress, view from the rear starboard quarter. Image courtesy of Marcus Bridle. For a larger (1280x960, 310kb) image, click here. de Havilland Mosquito NZ2305, reassembly in progress, starboard radiator area close-up. Image courtesy of Marcus Bridle. For a larger (1280x960, 304kb) image, click here. de Havilland Mosquito NZ2305 wing restoration information. Image courtesy of Marcus Bridle. For a larger (1280x960, 308kb) image, click here. de Havilland Mosquito NZ2305, reassembly in progress, view from directly ahead. Image courtesy of Marcus Bridle. For a larger (1280x960, 300kb) image, click here. de Havilland Mosquito NZ2305, reassembly in progress, view from the rear starboard quarter. Image courtesy of Marcus Bridle. For a larger (1280x960, 303kb) image, click here. de Havilland Mosquito NZ2305, reassembly in progress, view from the starboard side. Image courtesy of Marcus Bridle. For a larger (1280x960, 301kb) image, click here. The MOTAT restoration crew. Left to right, John Ellis, Ron Wilson, Clive Kyle, Ken Beckett (kneeling) and Norm McKelvey. Image courtesy of Marcus Bridle. For a larger (1280x960, 305kb) image, click here. NZ2305 starboard wing, January 2001. Image courtesy of Brendon Deere. Wing centre section and undercarriage, January 2001. Image courtesy of Brendon Deere. NZ2305 Engine, January 2001. Image courtesy of Brendon Deere. NZ2305 port undercarriage, January 2001. Image courtesy of Brendon Deere. NZ2305 nacelle, January 2001. Image courtesy of Brendon Deere. NZ2305 port undercarriage late August 2000. Image courtesy of Mark Wade. Note: To view a large (1027x1526, 328kb) version of this image, click here. NZ2305 wing and undercarriage late August 2000. Image courtesy of Mark Wade. Note: To view a large (1536x852, 259kb) version of this image, click here. NZ2305 wing, Museum of Transport and Technology, NZ, 25th August 1999. Image courtesy of Phillip Treweek. NZ2305 fuselage, Museum of Transport and Technology, NZ, 1991. Image courtesy of Phillip Treweek. NZ2305 cockpit interior, Museum of Transport and Technology, NZ, 1991. Image courtesy of Phillip Treweek. An old photo of NZ2305 before the main spar was removed and rebuilt. Image courtesy of Mark Wade. Originally laid down as an FB.40, A52-19, at the Bankstown de Havilland Australia factory, the aircraft was modified to T.43 trainer standards and allocated the serial number A52-1053. 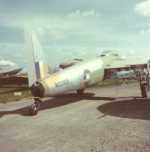 The aircraft was accepted by the RAAF on 6th August 1946, and put into storage at No. 3 Aircraft Depot at Archerfield, Queenstown until December 18th when it was sold to New Zealand for £3,000. A52-1053 was given the new serial number NZ2305 and allocated to No. 75 Squadron on 1st April 1947. Seeing little service while with 75 Squadron, NZ2305 was sold to a farmer, Robin Coleman of Galpins Line near the town of Marton in the south of North Island in 1952. The rotting remains of NZ2305 were discovered by a Mosquito enthusiast, Charles Darby, and the farmer very kindly donated the remains to the newly formed MOTAT. The project of rebuilding NZ2305 was initially taken on by Peter Dingwell, under whose guidance the fuselage was rebuilt. Restoration work was then passed to Dave Stewart. The wings were rejoined by the RNZAF Museum in Christchurch. Apparently the aircraft's reassembly is now just a matter of time and space! The date of NZ2305's retirement has been quoted as 1952 and 1955. If anyone has further information on the above and cares to supply me with details, please contact me.